The Best Onion Bacon Cheese Dip / Spread. Based on the famous Neiman Marcus Dip, this is a little creamy, a lot cheesy, a bit crunchy and thoroughly scrumptious. I took it to a New Year’s Eve party. It was gone before the rest of the goodies were in place! I have made this with all mayonnaise, but we like it best with half sour cream because that lets the other flavors shine more brightly. Do not substitute other spreads for the mayo. I also use the packaged bacon pieces – real bacon. It saves time and hassle during party prep time. I have also cooked a package of bacon ahead of time to use in recipes like this during holiday time. Cut the cooked bacon into very small pieces if you go this way. Use a four ounce package of slivered almonds and toast lightly in a small skillet before adding to the mix. If slivered almonds are not available, chop about two tablespoons or a small handful of whole almonds. Finely shredded cheddar is easier to mix and also makes it easier to eat. Save a few rings from the green onion top to sprinkle over the finished dip. You can serve in a bowl. Or press the spread into a bowl or other mold and chill for about 15 minutes before turning out on the serving plate. Serve with crackers – butter crackers or water crackers are great. So are sturdy corn chips. Or fill celery sticks with the mixture. Last time I made this, I served it with crackers and carrot sticks to accompany soup for lunch. You can tell we like this for spur of the moment savory since there are so many adaptations to whatever happens to be on hand. 🙂 Take it to a party. Just be sure to double the recipe because it disappears really quickly!!! 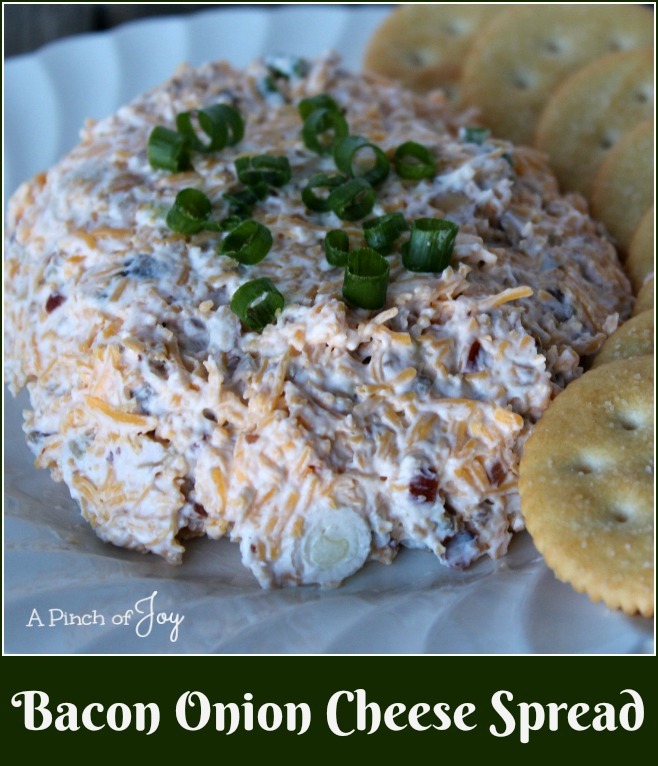 The Best Onion Bacon Cheese Dip / Spread-- a little creamy, a lot cheesy, a bit crunchy and thoroughly scrumptious.